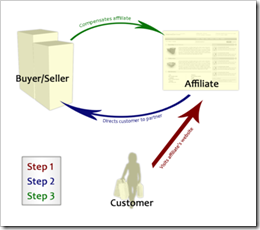 What is an Affiliate Marketing System? See the picture courtesy of en.wikipedia.org , It explains that when an Advertiser wants to sell something they will got to an affiliate site and market their product their. Then the publisher will market the product in many ways such as Email, Blog, and other means of promoting the items. If somebody buys from the publisher, the publisher get his commission base on the total transaction. 1. Find a hot market (health, golf, pets, anything that you can think about,…). 2. Find an affiliate product (register with a free affiliate program). 3. Promote your affiliate links. 4. Get your affiliate Commissions. I am still in the process of understanding this things. I still believe that you can learn a lot from your readers. Do you have any experience or insights about this ? Let me know thru comments, Or you can share some great site where we can all study tips and techniques about the subject. In the future I will make some post as regarding this matter. Mistakes and Tips. Wow, that was easy money. Check this out. Nella, Do you have any good experience with this care to share. ?